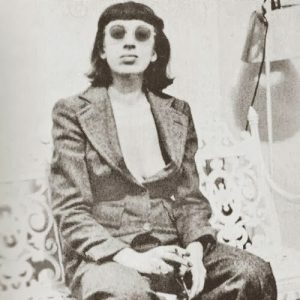 Lee Krasner was an important artist who formed a part of the Abstract Expressionist movement that came to dominate the avant-garde in the post-war United States. Krasner can be seen to have had a dual legacy in this regard: as well as a prominent abstract painter, she was also the wife of Jackson Pollock, helping to guide him towards his signature style and managing his career and estate, ensuring his recognition. From the early 1980s, Krasner achieved increasing prominence as an artist in her own right. Where once she spent time and effort placing her late husband’s works in museum collections, now her own hang there too. Krasner was born Lena Krassner in Brooklyn in 1908, the daughter of Russian Jewish parents. As a young woman, her desire to become an artist was already in evidence, and she attended the Washington Irving High School before going to the Cooper Union for the Advancement of Science and Art and subsequently the National Academy of Design. Shortly afterwards, she was employed in the Works Progress Administration, which itself became one of the great crucibles in which the greatest of American artists from the mid-20th Century were forged. Krasner’s central position in the art world at this critical moment is reflected by the fact that she introduced the art critic Clement Greenberg to Hofmann, and later to Pollock. In 1936, Krasner was one of the founders of the American Abstract Artists group, and it was through this that she met Pollock. They eventually married in 1945, moving to The Springs in Long Island a few years later. It was there that Pollock had the legendary barn studio in which he could lay his canvas on the ground and drip paint in his signature style. By contrast, Krasner’s studio was upstairs in the house itself. The difference in scale of the studios was reflected in the scale of the pictures—hers were essentially more intimate, which in some ways was better suited to her more composed, less gestural style. The sense of composition and control that she had learnt through her classical training and later from Hoffmann gave her works an extraordinary sense of poise and balance—factors that also bled into Pollock’s works through her influence. Pollock had looked to the art of Native American tribes such as the Hopi and Navajo for inspiration; Krasner turned instead towards her own Jewish heritage in a group of pictures called the Little Images. Works from this series, such as Untitled of 1949 from the Museum of Modern Art, New York, contain a swirling mass of glyphs which tantalisingly resemble letters and symbols yet elude reading. These works reveal Krasner re-establishing herself as an artist at the time that Pollock and Abstract Expressionism were in the ascendant. Similarly, in an act of self-cannibalism and self-criticism, Krasner made a group of collages in the mid-1950s that comprised dismembered strips of her own earlier works, rearranged to vivid new effect. The older pictures which had apparently dissatisfied her—very few now remain—became parts of a celebratory cycle of movement and colour. A few years after Pollock’s death in 1956, and that of her own mother, Krasner created an elegiac group of works in subdued colours yet filled with a sensual rhythm, sometimes called the ‘Umber Series’. These pictures were made on a large scale in Pollock’s barn studio, which she now occupied. She ascribed their muted colours to her insomnia at the time—she was working at night, and preferred to work with colour by daylight. Several of these works are in museum collections, such as Polar Stampede of 1960, now in the San Francisco MoMA, and Gothic Landscape of the following year (Tate, London). Later, colour would re-emerge in Krasner’s paintings, resulting in large-scale, sumptuous celebrations of form that are often compared to the Fauve works that had so impressed her during her early years. In another return to—and re-examination of—her origins, Krasner returned to collage for some of her last works, taking her cubistic drawings from the mid-1930s and cutting them up, reconfiguring them to new effect. In 1981, the Guild Hall Museum of New York University held an exhibition entitled Krasner/Pollock: A Working Relationship, which reappraised the relationship between the two artists. This also allowed Krasner to escape the lingering ‘Mrs Jackson Pollock’ label that had dogged her for so long. It was followed by a retrospective a couple of years later. Since then, there have been a number of monograph shows of Krasner’s work, and she has been enshrined in the fabric of post-war American art.